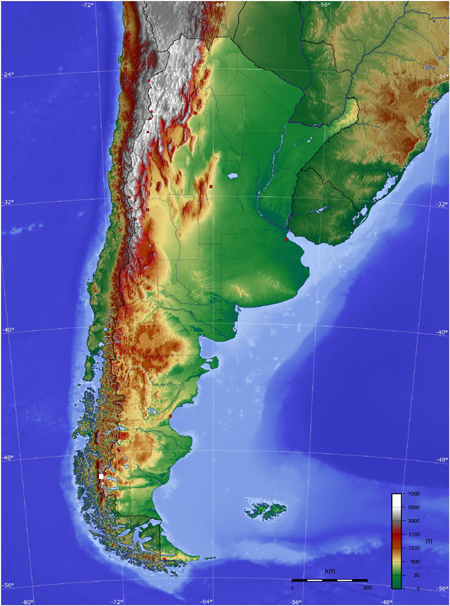 Geografi: Argentina er en demokratisk, sydamerikansk republik med grænser til Bolivia, Brasilien, Chile, Paraguay og Uruguay og med kystlinjer mod øst til Det argentinske hav / the Argentine Sea / Mar Argentino i det sydlige Atlanterhav og mod vest til det chilenske Magellanstrædet. Falklandsstrømmen / the Falkland Current har sit udgangspunkt i Antarktis circumpolare havstrøm / Antarctic Circumpolar Current og løber op langs Patagonien. Ildlandet / Tierra del Fuego. Argentinsk Antarktis. Kultur: Andesbjergenes Kristus. Facundo Cabral. La prensa argentina. / : Ignacio Orzali, 1893. Argentina var medlem af ABC-staterne under første verdenskrig, Folkeforbundet i mellemkrigsårene og er bl.a. medlem af Antarktis traktatsystemet / Antarctic Treaty System, FN(http://www.un.org/depts/dhl/unms/argentina.shtml), the International Atomic Energy Agency (IAEA), Riotraktaten og the South Atlantic Maritime Area Organisation, Sydatlantens freds- og samarbejdszone / South Atlantic Peace and Cooperation Zone. Forsvar / militær: SIPRI: Militærudgifter / Military expenditure of Argentina. Værnepligt: WRI: Country report and updates: Argentina. FN operationer. Libro Blanco de la defensa Argentina Bicentenario /2010. / : República Argentina - Ministerio de Defensa, 2010. Efterretningstjenester: Secretaría de Inteligencia. Operación Cóndor. Den nationale kommission vedrørende forsvundne personer / Comisión Nacional sobre la Desaparición de Personas, CONADEP. Sociale forhold: Richard Minns: ‘Estafa’ : Dictatorship, debt, weapons and pensions in Argentina — An alternative perspective on pension ‘ reform ’ in Latin America, 2007. I: Pensions : An International Journal, Vol. 12, 4, 199–205. UN data: World Statistics Pocketbook | United Nations Statistics Division. Byttemarkeder. Økonomiske kriser: 2002. Goni, Uki: Galopperende inflation ryster Argentina. I: Information, 02/06/2014. CRS: Argentina’s Defaulted Sovereign Debt: Dealing with the “Holdouts”. / : J. F. Hornbeck. February 6, 2013. 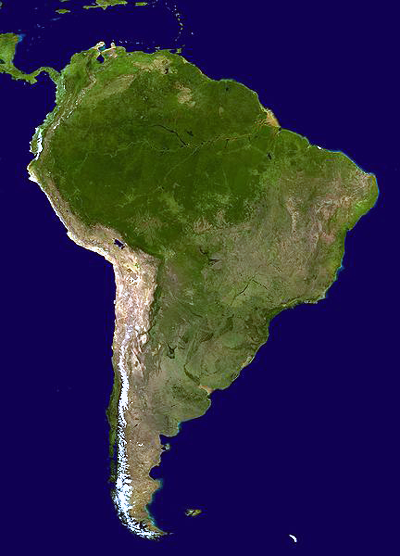 'In December 2001, Argentina suffered a severe financial crisis, leading to the largest sovereign debt default in history. In 2005, after prolonged, contentious, and unsuccessful attempts to restructure the debt, Argentina abandoned the negotiation process and made a unilateral offer. The terms were highly unfavorable to creditors, but $62.3 billion of the $81.8 billion in principal owed was exchanged. A diverse group of “holdouts” representing $18.6 billion did not tender their bonds and some have opted to litigate instead. These actions resulted in attachments orders against Argentine assets, leaving the country unable to access the international credit markets and mired in litigation. Naturressourcer: Aluminium ; bor ; lapis, uran. Washington, D.C., June 25, 2013 -- During 1963-64, the Israeli government secretly acquired 80-100 tons of Argentine uranium oxide ("yellowcake") for its nuclear weapons program, according to U.S. and British archival documents published today for the first time jointly by the National Security Archive, the Nuclear Proliferation International History Project, and the James Martin Center for Nonproliferation Studies. The U.S. government learned about the sale through Canadian intelligence and found out even more from its Embassy in Argentina. Washington was concerned that the yellowcake purchase cast doubts on Israel's claims about a peaceful nuclear program. In response to U.S. diplomatic queries about the sale, the government of Israel was evasive in its replies and gave no answers to the U.S.'s questions about the transaction. Energi, erhverv, handel og industri: Atomkraftværker. Produktion og eksport af: Biler, cement, fly, våben.